The black vintage Vespa looked resplendent parked in the grand driveway of The St. Regis Hotel Rome. “I’ve been driving a Vespa since I was fourteen!”, beamed its proud owner, Michele. I’d been waiting for this afternoon for months. 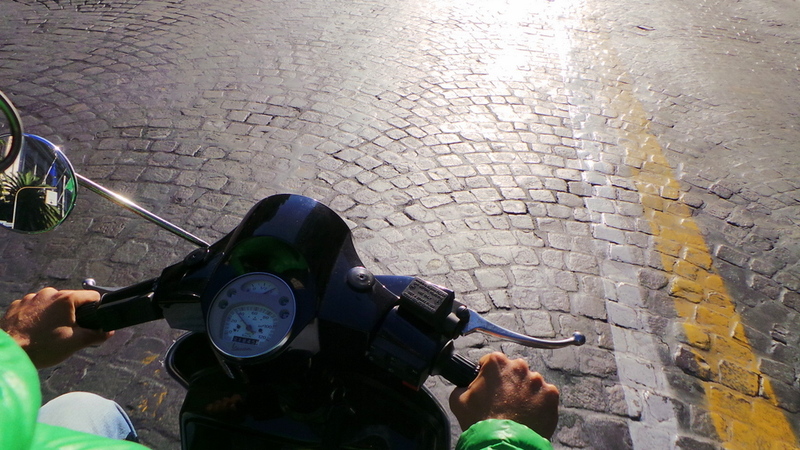 Since I discovered Scooteroma while planning for my Italy trip, I knew I had to hop behind a Vespa to explore Rome. 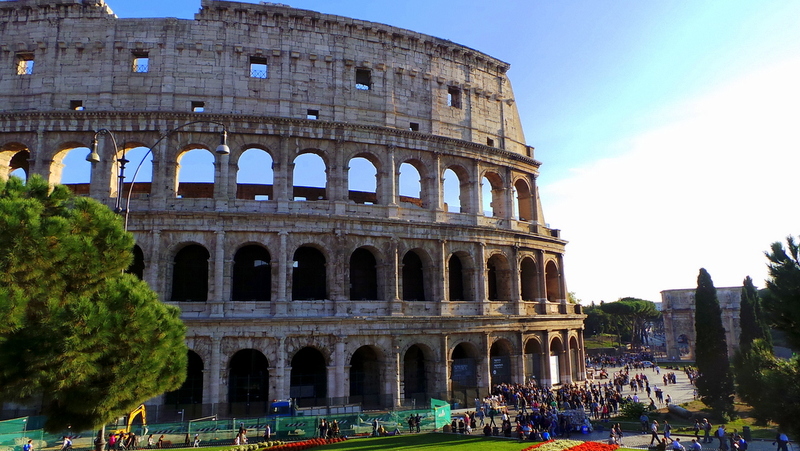 Rome (well, Italy as a whole) is undeniably an extremely tourist-laden place. Pick any time of the year and Rome will always be teeming with tourists. Scooteroma is run by Annie, the Scooter Maven and her husband Giovanni. um, Hello, GiovAnnie! 🙂 Booking the tour was really easy. Due to pre-scheduled meetings, I chose the sunset tour. Annie initially planned to drive the Vespa (with me in tow) herself but business called for her to be in Paris on the last minute (she scoots the World frequently too!) , so she sent her best tour guide and driver that afternoon. And so it was at 3PM that afternoon when Michele (pronounced Mick-kell-le, rhymes with Ukelele) picked me up for the 3-hour tour. I know scooters / motorcycles are a norm for travelling for some people but for me it is still a novelty. (Which is ironic, given that our family business is based on sports and motorbikes!) But the only few times I’d been in the back of a motorcycle was in China, Cambodia and most recently (and I mean 7 years ago!) in Malaysia with Zombie driving it. 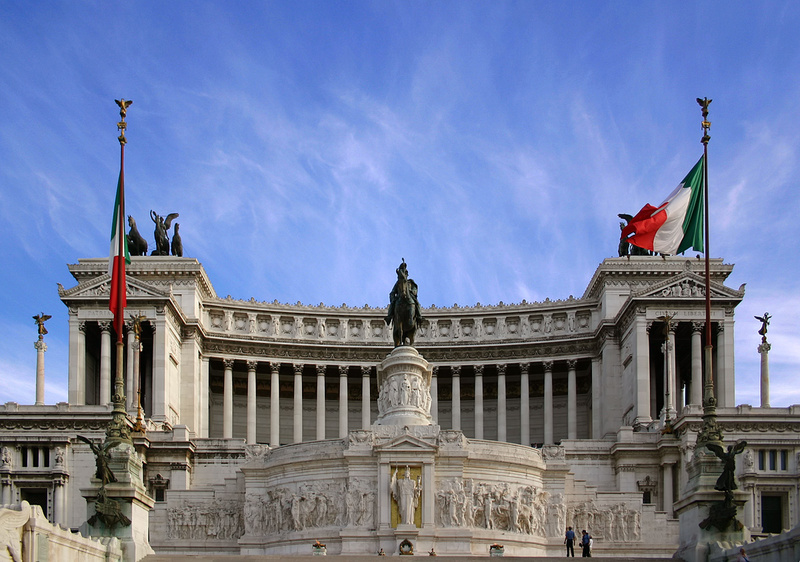 While this may look grand and photogenic, Michele explained why Italians, and most of all, Romans, have feelings of criticism / mild animosity towards it due to its pompousness and it being too conspicuous. When Michele mentioned that he was born and raised in Rome, I’m glad that he didn’t see my eyes widen like saucers from behind. Earlier that day, I was speaking to two locals who were from Milan and Sicily. When I first asked them if they were from Rome, they laughed and said that nowadays, it’s almost impossible to find a Roman in Rome. And so I don’t know if those two were exaggerating, or was I really straddling the Vespa of a Roman gem? It didn’t really matter, because as any Roman from Rome would, Michele was now passionately explaining something about the Colosseum using one hand to make ardent gestures while his other hand was expertly maneuvering the Vespa as we weaved our way around cars. Surprisingly, Michele never missed a beat (nor did we bump into anything), while multi-tasking. And even more surprisingly, it all felt very safe! And then we stopped at the Colosseum. I’d just been there the night before, doing an underground tour but seeing it in daylight still has a way of bringing out it’s magnificence. With the tourists around (there are very few at night), the emphasis on how grand the Colosseum is more evident. Michele explained in great detail how the Colosseum was structured, and added some interesting points that I did not previously know. For instance, did you know that death in gladiator matches were rare and not as bloody as Hollywood made us to believe? Deaths in matches only usually came for criminals and amateur gladiators. But the likes of Maximus Meridius are protected by their managers / agents, who usually arrange an outcome with the opponent’s manager, as they all get a hefty fee out of the cash cows (the star gladiators). It was also amazing to note that just like today’s ultra modern sports centres and arenas, the Colosseum also had a ticket seating system (you will see numbers etched around to indicate seating areas and gates) and a retractable protective canvas cover (which is now gone) to protect gladiators, emperors and spectators alike from the harsh Roman sun? 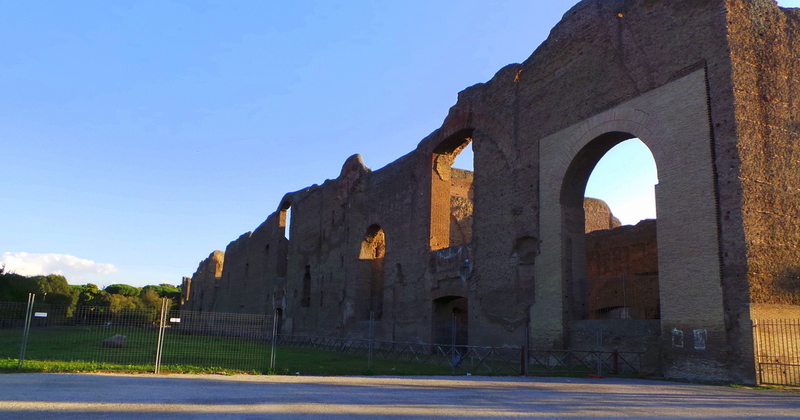 Moving on, we went to the Baths of Caracalla, the second largest Roman public baths (or thermae). Michele explained how this was built, and that the ancient Romans only used gravity through aquaducts for water supply in the baths. The technology employed to control the water temperatures were also very complex. Michele has a very detailed way of explaining the Roman way of construction, so much so that it was easy to play in my mind, a CG (Computer Graphics)-like effect o these ruins coming to life as he painstakingly described how each piece of brick was laid out. And just as the Circus Maximus played venue to wild entertainment back in the day, it was also venue to one of the most smashing concerts just a few months ago when The Rolling Stones performed live on the grounds of Circus Maximus! We stopped by one of the gates of Rome, Porto San Sebastiantino. It’s really incredible to think how strong and solid these structures were built to withstand centuries! Sure it may be ruins now, but I doubt today’s modern buildings, which are built in ultra-fast speed of light, can stand like this after thousands of years. 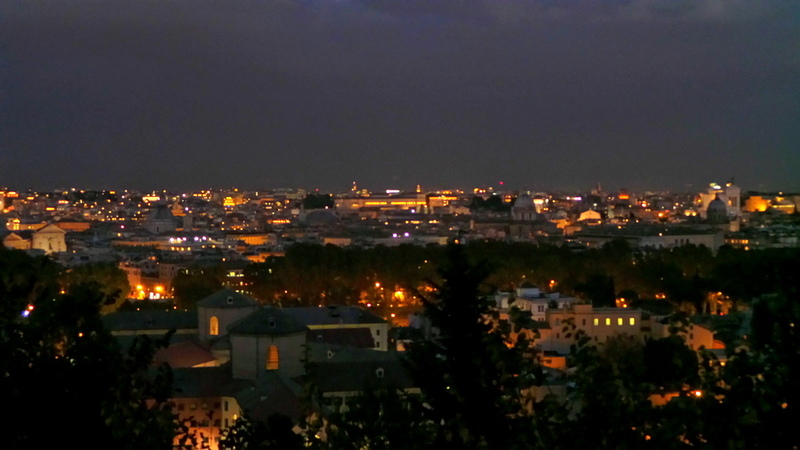 As the sun started to set, we drove up to Giancolo Hill (one of the seven hills of Rome) which is also home to a quiet and exclusive residential neighborhood. But it’s also home to possibly one of the most wonderful sunsets I’ve seen in my lifetime. 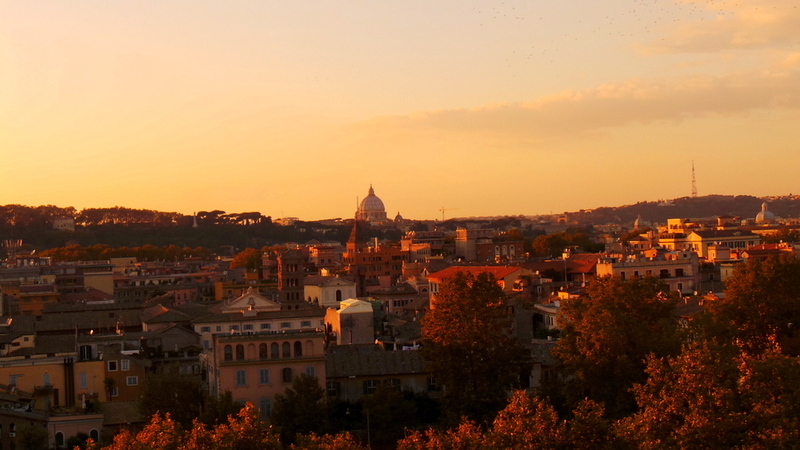 There she is, the Eternal City basking in sepia-sunshine. After I took this picture, a flock of birds crossed the skies. It was quite a surreal sight, nothing I’ve seen in any images, movie, or postcards before. A part of me wanted to linger abit more as I’ve really never seen anything quite like this before. I’m used to beach, island and resort sunsets but nothing like this. 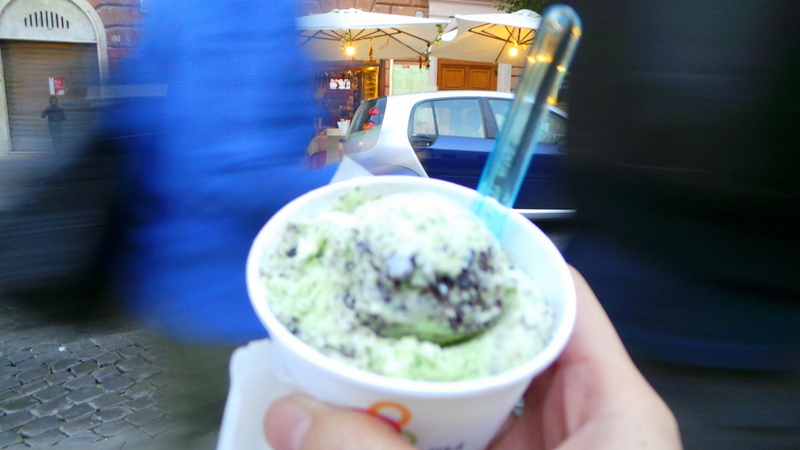 We descended down the hill and went to the other side of the city, where we stopped by a local Gelateria where I was treated to gelato. Rome has the perfect weather. It’s not too cold or too hot and even though this was early evening in late October, it wasn’t too freezing to enjoy a mint chocolate chip gelato. Here I learned more about modern local life in Rome as Michele spoke about his favourite jaunts and places where he hangs out and plays with his nephews. It was great to step out of the tourist-mode and get a glimpse of what day-to-day life here is like. I was ooh-ing and aah-ing over the soft glow of lights when Michele told me that the real highlight of this place was just underneath us. Like, right below our noses was the Roman JAIL! Not that I ever dreamed of going to jail, but how cool is that?? Michele told me that he was right at this spot a few years ago when he saw (and heard) himself how inmates communicated with their friends from outside. That’s a hilarious way of communicating, but I was told it’s pretty common! I was really tempted to give my regards to Mario before leaving. Or just shout a name, any name at all just to see if I get a reply. And after passing a few more monuments, we finally reached the city and just like a true Roman gentleman, Michele dropped me off back at The St. Regis. Hands down, this is easily my favourite activity in Italy. The Vespa ride itself was cool, but even better was the very knowledgeable guide / driver I had. Let’s put it this way: one of my dreams is to visit the Galapagos with Sir David Attenborough as my guide. I got my equivalent in Rome with Michele as he was so passionate about Rome’s history and answered my questions in great detail. He doesn’t just give the usual touristy spiel normally encountered in big groups. We even spoke briefly about ancient and the more contemporary slavery in the last century so he is quite knowledgeable in all topics. And let’s face it, with movies like Roman Holiday, the hype and ‘romance’ of Vespa + Rome is quite a novelty that one must do when in Rome. I honestly am more thrilled thinking about how being in a Vespa was like doing a modern-day Roman chariot tour. Yes, you can hire horse-drawn carriages in Rome but that’s just too cheesy. As we were riding back to the city, we encountered another Vespa tour company that did their tours in big groups. Lined up like ducks in a row, the sound of their combined engines were deafening, and a group tour is still a group tour. With Scooteroma, you can even custom your tour and ask the guide to stop in any areas you would like. Communicating with Annie over email had also been easy from the beginning until the end, even e-mailing me from Paris to ensure I enjoyed the tour. Scooteroma is definitely a company that puts emphasis more on the quality of tours rather than the quantity. A: Depending on the tour you choose, it can take from 4 to 6 hours. Here’s a list of all the different types of tours Scooteroma offers. Q: I’ve already been to Rome before, should I still do this? A: Definitely. 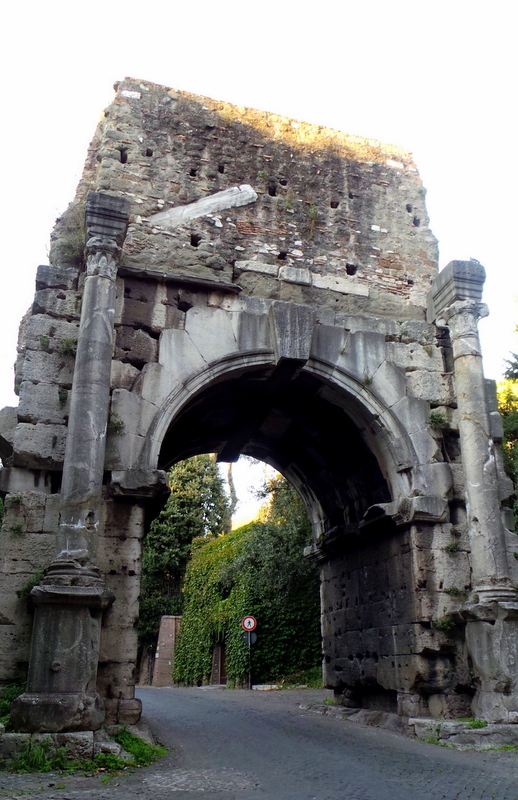 Chances are, your first visit in Rome involved tour groups. Scooteroma is personalised so it’s more memorable. I also had been to the Colosseum the day before I took this tour. But it was still a different experience seeing it on two wheels! Q: What was your favourite part of the tour? Q: To whom wouldn’t you recommend this tour? Well unless you are extremely un-fit and have major health issues, or prefer being in groups, then I would suggest this to anyone. A great way to explore a city. We did a sidecar tour of Shanghai and it was amazing! OMG… What a ridiculously fun way to explore a city. Love it. Although, Id prob book the cheesy horse and cart tour thing too, itd be hilarious. 🙂 I shall have a look at doing something similar in Asia. 🙂 Love your posts. So inspiring. Have a great weekend lovely. Yes Anna it was great fun you’d love it for sure! The horse rides are too slow 😉 Be very careful in Asia when you get to doing it – I think I was more relaxed in Italy behind a bike as you know how crazy oncoming traffic and cars can be in Asia! Fantastico! 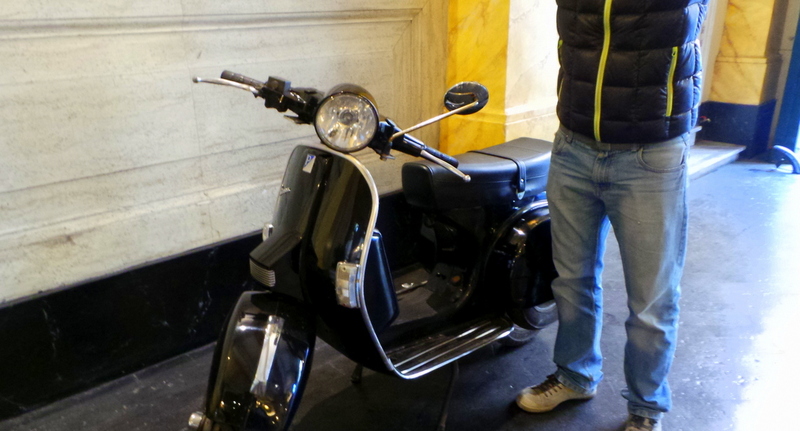 I’ve never been on a Vespa, and that’s daft… imagine I lived in Genoa for a year and never had a scoot. I know I would adore this tour, thanks for heads up. Grazie Mille Seana! 🙂 Oh you should do it when you go back to Italy with the family! Your kids will love it for sure! Alas that’s what happens when we live in a place (for me anyway), “there’s always next time” is what I think and then I miss out! That looks amazing, Jean! Well done! Again, great job, love your adventurous spirit and how well you document it! Wow Alex 10 years coming up soon! Must be exciting to plan where to go! Possibilities are endless 🙂 It was my first time in Rome and I hope to be back one day. 150km on a bike!!! yikes! I would have been terrified! We love Scooterroma! Thank you for such a great record of your experience- wish I was that detailed I forgot some of the stops! We had the tour in July with Annie and it was amazing! We did about an hour and got rained out, so she bought us some cornetto’s and coffee and got a taxi for us to a museum- we picked the tour back up 3 days later (after walking all of Rome) and learned so much Roman history from her! 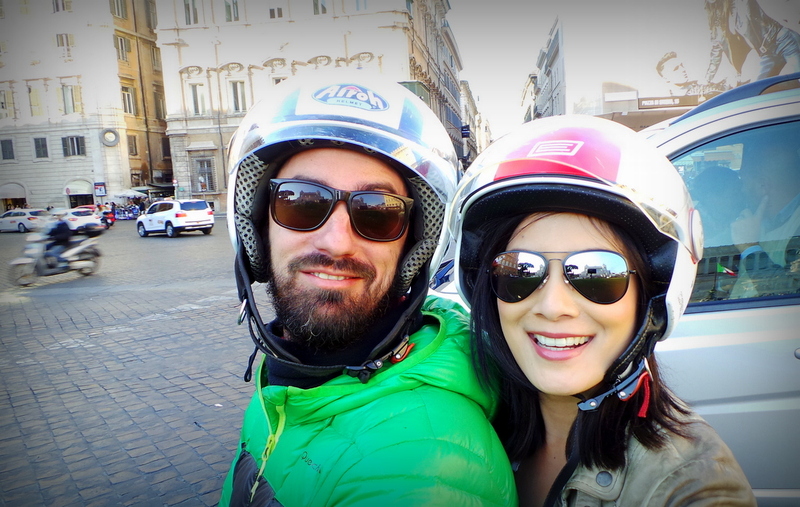 Highly recommend scooters in Rome – as well as a different experience Biking in Florence (Tuscany Cycle) and kayaking in Naples (Kayak Napoli). The best way to vacation!!! It must be more interesting to already have had a walk around Rome and then seeing it again with Scooteroma. Three places come to my mind about scooters, motorcycles: Rome (of course), Marrakech and Kuala Lumpur. Moroccan and Malaysians are the wildest drivers, it’s crazy what happens there. At least there is some common sense in Italy. But in Morocco and Kuala Lumpur, they almost ran me over a few times.